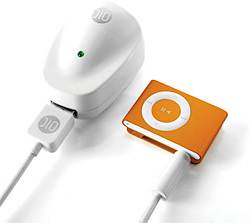 DLO PowerBug Charger For iPod Shuffle | OhGizmo! Now that Apple has recently “upgraded” the iPod Shuffle in their traditional way of just re-releasing something in different colors (what innovation!) the diminutive MP3 player has been pushed back into the spotlight for at least a few more days. So if you’ve just ran out and bought yourself one of their multi-color wonders you’re probably aware that since it’s so small it doesn’t have room for any extra ports besides the headphone jack which it has to use for charging. The provided cradle works well enough for charging off a computer’s USB port but for those times when you need to travel light you’re not going to find a smaller AC adapter than the PowerBug from DLO. It’s dead simple to use with a single green LED indicating the charging status and a convenient fold flat design. It also includes a USB to stereo mini cable for those times when you don’t want to carry the Shuffle’s cradle. The PowerBug is compatible with both the 1st and 2nd generation Shuffles and is available on the DLO website for $22.99. Well, I’m not sure it’s been described as an “upgrade” just an “update”. Besides, they did “upgrade” the Shuffle by including the new headphones.